I don’t even know where to start right now. All I can say is that I am completely blown away. It isn’t very often that a book catches me by surprise. I am a writer myself and so I usually try to figure out the plot and where the author is going with the story, why I am reading it. I was so engrossed in Rachel Carter’s book and so completely captivated that I just wanted to know what happens next…the story wasn’t as predictable as I thought it was going to be. Of course, with this being a trilogy…there has to be a cliff hanger but I wasn’t expecting this cliff hanger. Rachel left me wanting more. She wet my appetite, now I want the next course, and I don’t know where I am going to find the patience to wait for the next book. Can I just say that if Miss Rachel Carter wants to send me a copy of her second book…I would be jumping up and down. 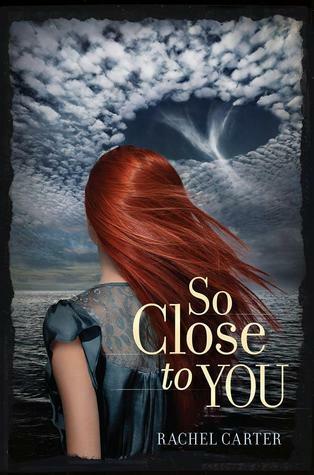 A big part of why I am reviewing this book on my blog and not just goodread’s is because I have a very special copy of SO CLOSE TO YOU. My copy was signed by Miss Rachel Carter herself. She had a giveaway that I entered on I believe the very last day you could enter and I won. I wasn’t expecting at all to win. I thought I would give this giveaway a chance even though I didn’t think I would win at all, needless to say I was completely stoked running out of my room ready to share the good news with the first person I saw as soon as I read the email. I tweeted Rachel thanking her for sending me the book and that I couldn’t wait to read it. I was hooked on page 1. I didn’t want to put the book down. That night my eyes were glued to the page. I think I was up until 3 am before I finally gave up to try to get some sleep. I am one of those people who work a full time job during the day, so I was completely impatience about wanting to get home to finish the book. It seemed like things came up every day because I didn’t get the chance to finish SO CLOSE TO YOU until today. I was only half way through the book when I was already recommending people that I work with to read the book, and telling friend’s that they should go pick up a copy. I guess I should start telling you more about the book and less about my experience with it. The Story is about Lydia and how she comes to find out that the Montauk Project really truly does exist. She realizes that her grandfather isn’t crazy and she wants to save his childhood. What she doesn’t know is where to start or what the consequences will be. Lydia loves her family so much that she is willing to do anything for them. Lydia meets Wes, a mysterious boy, first when he happened to be in the facility where Lydia became stuck in the Montauk Project; she doesn’t expect to see him again in 1944 where she becomes part of the past. The book shows Lydia’s journey in the pass and how Wes is involved. There is so much I want to say about what happens in the books but I don’t want to give any important spoilers away. Lydia: The heroine of our story. She is definitely one of my favorite characters. I am usually one of those people who pick one of the not necessarily minor characters but one of the characters who is not a lead in the story. I am not usually the hugest fan of the lead characters. For example: Yes, I read twilight and my favorite character was Alice not Bella, not Edward, and not Jacob. I was an Alice fan the entire time. Rachel did a great job with Lydia, I think she has some room to grow, but I think she did well mapping out Lydia and her life. In a way I felt like I knew Lydia, like she was a personal friend of mine, I was rooting for Lydia to succeed. I could relate to the love that she had for her family and how she wanted to fix things; to help the people she loved. I know that Lydia isn’t going to leave things how they are in her life right now, so I am looking forward to my next adventure with Lydia because I know that her time with the Montauk Project is not done. Wes: Definitely loved Wes right away. I was hoping that he wouldn’t be a “bad” guy but I think I would have been okay if we was. I just liked him right away. Wes is the boy that you crush on in high school. The cute loner boy that keeps to himself, not really saying much, being betrayed like he could be the sensitive type. I looked forward to every time Wes would enter in on the pages of the book. I had my own theories about Wes that are still up in the air right now, because I won’t to see where his future lies in the rest of the series. Mary: Who wouldn’t want a sister like Mary? She would be anyone’s perfect best friend. I guess I shouldn’t say anyone but just about you have to be a complete grouch not to love Mary. I even think that if you were a grouch, Mary could put a smile on your face. Mary has so many sides, one minute she is the complete flirt and the next she is wishing she could just get the one guy’s attention that she really likes. Mary is very blunt about things two which is what made me love her right away. I hope we will be able to see Mary again. Lucas: I had a feeling Lucas was going to be one of those sweetheart boys that is charming but yet who’s crushes never leave last long. I know a few Lucas’ in my own life. Lucas is more like the popular guy that has a new crush every week. It was so easy for him to switch his focus to another girl. I have never been drawn to time traveling books but SO CLOSE TO YOU has made me think about possibly trying out the genre again. I might just leave my time traveling experiences to Carter's book only. I don't want to get my hopes too high because Carter's book definitely set the bar high for my experiences with time travel. I absolutely love that the book is set in our time and in the time of World War II. I have always had an interest with World War II and the holocaust. Rachel: You did a great job with your debut novel. I am looking forward to the sequel. Keep Writing you definitely have a fan in me.